A company with a wealth of experience, Action Surveillance and CCTV Ltd is a progressive forward thinking company with specialist knowledge in advanced digital surveillance and home securities. Action Surveillance and CCTV Ltd is a cutting edge organisation that provides the highest level of Investigatory and installation services. Combined with the latest technology our CCTV engineers and professional witnesses have the means and equipment to combat nearly any situation. Over the years we have experienced that covert hidden camera & audio surveillance is a convenient and cost effective way to monitor and primarily gain essential evidence of a suspected criminal carrying out a criminal offence. Home burglary can happen in any neighbourhood. Statistics show homes without some sort of security systems are about 3 times more likely to be broken into than homes with security systems. Many home owners don’t realize how vulnerable they are in their own home until it’s too late. A new version of our best tracking device is the ASCmk01, which now uses a high capacity Lithium battery, greatly extending its operating time. When battery life is critical this is the tracker you need, offering over 4 weeks battery life The unit is sealed in a hard case IP66 waterproof cartridge and with high power neo magnets to ensure the tracker stays put when in position. We are very mindful that many companies take the money but don’t provide the aftercare service that they promise and can sometimes be a nightmare to get hold of! At ASC we are very proud to carry out our promise by fulfilling what we agree with you in the maintenance contract. 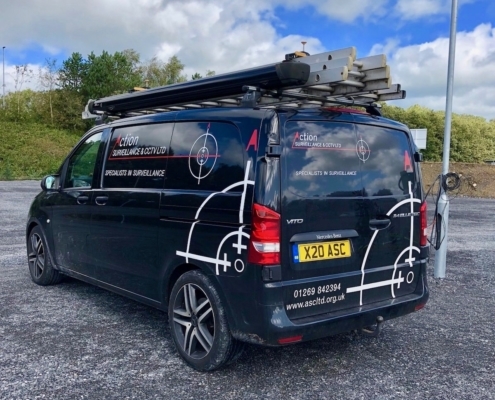 Action Surveillance & CCTV cam to our business premises and quickly scoped out our needs, within a few days we had a system in place that not only protected our staff but also our customers, we are very happy with the work carried out and would highly recommend their services. Carl came to our home and pointed out all of the flaws in our current security set up, he got to work and fixed it with newer robust equipment and now we can sleep with peace of mind.